The combination of being an October baby and growing up in one of the nations most spooktastic Halloween zones, has made me a Halloween loving monster. Seeing how the various communities come together to paint windows, put on parades, pull together hayrides and create some hair raising haunted attractions, fills me the spirit of Autumn. Just outside New York City, the Hudson Valley region is home to the legendary Sleepy Hollow and a bevy of award winning attractions. I put together my top picks for family events in New York and Connecticut, including the best of the best, fun for families with small children, fun for bigger kids & kids at heart, free community events, and places to pick your own apples and pumpkins. If you readers have any favorite Halloween events or attractions, please add them in the comments! 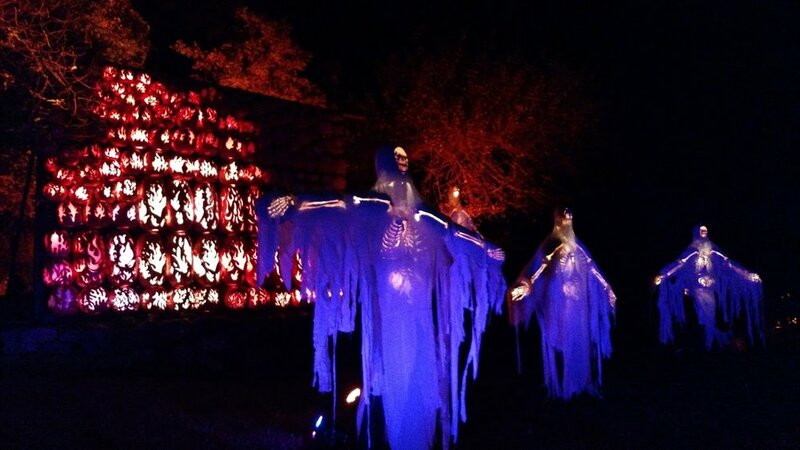 Horsemans Hollow: This is Sleepy Hollow’s premiere haunted attraction, right in the heart of the village. Stocked with professional actors and state-of-the-art special effects. It is not for kids, and high on fear factor. 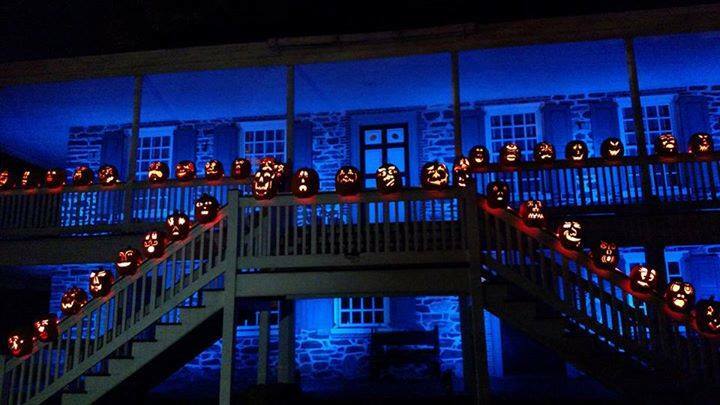 Taking the tale of the Legend of Sleepy Hollow to its darkest extremes, the 300-year-old Philipsburg Manor transforms into a fearsome landscape ruled by vampires, witches, undead soldiers, ghouls, and ghosts, all serving the Headless Horseman himself! Its dates are October: 5-7, 12-14, 19-21, and 25-31. Tickets are $20, and $25 on Saturdays. Advance tickets are recommended, but can be purchased on site with a surcharge. Irving’s Legend at the Old Dutch Church: Master storyteller Jonathan Kruk returns for another season offering his signature dramatic performance of Washington Irving’s classic tale, “The Legend of Sleepy Hollow,”. Flavored with live spooky organ music by Jim Keyes, Kruk’s 45 minute show has captivated generations of local residents and visitors alike. Its a do not miss. The dates are October 5-7, 12-14, 19-21, 25-31. Tickets are $25 for adults and $20 for children and must be purchased in advance. Sleepy Hollow Hayride & Block Parties: On October 26th & 27th, climb aboard Sleepy Hollow’s annual Haunted Hayride and watch out for the Headless Horseman! Join the block party on Beekman Avenue before or after your hair-raising ride through the real Sleepy Hollow. On Saturday night is the annual costume parade. The block party and parade are free events, but the Hayride requires advance tickets for $35 per person. Home of the Legend: This year, the tour of Washington Irving’s Sunnyside estate takes on a spookier vibe. Visitors will learn about the history behind scary stories and haunted legends such as vampires and séances. The younger set can create Halloween-themed art activities, go on a scavenger hunt, play games, watch shadow puppet performance and pose for photos. Advance tickets are essential. Tickets are $16 for adults, $12 for seniors and students, $8 for children 3-17, free for children under 3 and members. Halloween Magic Show: On Thursday, Oct 25th at 7pm, enjoy Halloween-themed magic with Pete and Chris Amusements. This free event is good for all ages and takes place on the 3rd floor at the Warner Library. Rocky Horror Picture Show: A Halloween season classic! Come to Tarrytown Music Hall at 11pm on Oct. 13. At this show, not only will you get to screen the Halloween rock classic but you’ll also get a floor show complete with live performers and audience participation. Don’t forget to come in costume. Two ticket options available. Regular ticket: $15; ticket with participation kit: $20. This is the creme de la creme of New York Haunted Attractions. It covers 45 acres and includes a hayride, 5 haunted houses, a corn maze and live entertainment. It has been rated the #1 haunted attraction in the US by Haunt World Magazine, and top hayride in America by USA Today, MTV and New York Daily News, along with a bevy of other prestigious awards. It has been featured on the Travel Channel as well. Each season introduces a new narrative, and the cast and crew work year round to transform the space. It is carefully scripted and choreographed and the performers are well trained actors. The attention to detail, and their ability to spook even the toughest of non believers makes it worth coming back again and again. This is not for small children. Advance tickets are a must. Entries are timed, and do be prepared to wait up to an hour, from the time of your entry. Tickets are $45 and you can pay an additional $25 to skip the line if you can't stand waiting for your scares. 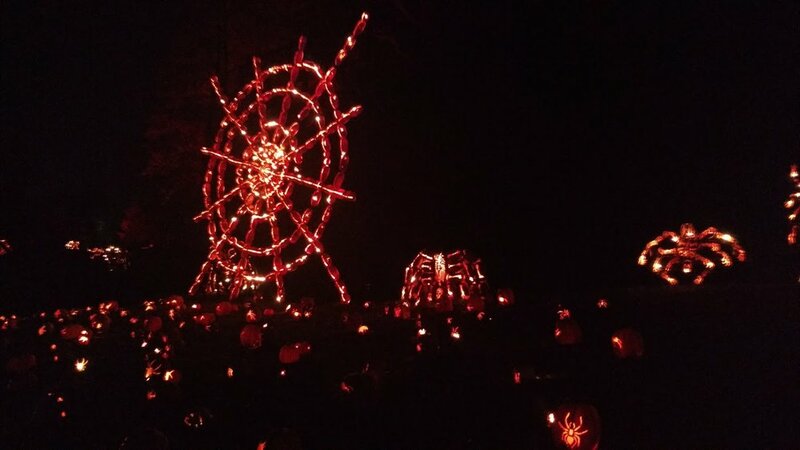 The annual Jack O Lantern Blaze at Van Cortlandt Manor has been dazzling visitors for years. More that 7,000 illuminated jack o'lanterns are arranged and cared for by over 1,000 volunteers to create a memorable spectacle. The awe inspiring scenes include dinosaurs, the Statue of Liberty, and the Pumpkin Zee Bridge. New this year, is a medieval castle and windmill. The work that goes into the Jack O Lantern Blaze is a monumental tribute to community spirit and the boundlessness of the artistic soul. It runs Sept. Oct. 4-31, and Nov. 1-4, 7-11, 15-17, 23-24. I suggest going in November after the Halloween crowds die down. Advance tickets are necessary and tend to sell out far in advance. Tickets are $22 for adults ($27 Friday-Saturday); children 3-17 are $16 ($20 Friday-Saturday); and children under 3 admitted free. Stew Leonards is killing it this year. Their Halloween offerings are always a hoot, but they have something for everyone in 2018. Throughout the month events include a hayride, multiple trick or treat events and even a contest for your dogs! Halloween Hayride Spooktacular: A 10 minute family friendly hayride that weaves through a course of more than twenty vignettes, including scenes of popular movie and television characters, traditional holiday settings, and a musical light show. I took my daughter 6 times last year, and it makes for a great introductory hayride for little ones. It runs daily through Oct 31st, 3pm - 8pm Mon-Fri and 10am - 8pm on the weekends.The Halloween Hayride Spooktacular is $1 per person; free for children age 3 and under. Trick-or-Treat with the Stew Leonard’s Characters: On Tuesday, October 23, from 4:00 P.M. to 5:00 P.M., children are invited to dress in their costumes and come to Stew Leonard’s in Norwalk to go trick or treating. Children can come with their own bags or Stew Leonard’s will provide one for them. Stew Leonard’s famous characters, including mascot Wow the Cow, will be available for taking photos with the children at the stations. No tickets or admission fee required. Trunk or Treat at Stew Leonard’s: On Friday, October 26, from 6:00 – 8:00 p.m., join the team at Stew Leonard’s in Norwalk for Trunk or Treating event in the store’s parking lot. Children, along with their families, will trick or treat from 36 decorated cars in the store’s parking lot. One car featuring the best spooky or wacky decorations will win a $250 contribution to their favorite charity. Stew Leonard’s Barkfest: Stew's remembered your furry friends. This Halloween, dogs are invited to Stew Leonard’s for a howling good time at the store’s first Barkfest event on October 27, at 10:30am! Customers may bring their pups dressed in their best Halloween costumes and enter for their chance to win a Bubba’s Barkery Gift Basket valued at $100. To enter a dog, shoppers are kindly asked to bring a small bag or can of dog food and all collected dog food will be donated to a local pet shelter. Halloween Day: On Halloween day children aged 12 and younger who visit the store in their costumes will receive a free small ice cream. You can't put that in your treat bag, but everyone loves free ice cream! Wells Hollow Creamery Corn Maze in Shelton, CT. Looking for a kid-friendly day or evening adventure for your family? Enjoy a visit to Wells Hollow Creamery every Saturday and Sunday afternoon or Friday, Saturday and Sunday evening during the month of October for an adventure through their corn maze, followed by some of their delicious farm fresh ice cream. This year, it is the Wacky Woodchuck Challenge. These woodchucks broke into the farm and stole a whole bunch of tools and his them through the maze. Those who take the challenge must find 8 colored posts and identify all the lost tools to win a prize. Bring flashlights for the night maze. Nobody jumps out at you, nobody chases you with a chainsaw, it is just good old fashioned family fun in a giant corn maze. The day maze runs from 12pm - 5pm, and the night maze is 7pm - 10pm. Tickets are purchased on site and are $6 per person for the day maze or $12 per person for the night maze. Children under 3 are free. Put on your costume and get into the Halloween spirit with Boo at the Zoo, taking place at the Bronx Zoo every weekend in October. The festival includes family-friendly activities like magic shows, costume parades, a hay maze, pumpkin carving and live music. Bigger kids, 12 and over might journey into the Haunted Forest. For adults, there are seasonal food choices and beer at Bootoberfest. Of course, visitors can also get an up-close look at all the creepy critters on display within the zoo. The weekends later in October tend to get really crowded and parking can be its own Halloween nightmare. I suggest going earlier in the season, or at least arriving early in the day. The event does not cost additional to zoo admission, but the admission costs for entry to the Bronx Zoo are Adult: $36.95, Child (3-12): $26.95, Senior: $31.95. Children aged 2 and under and members are free. At Lasdon Park, they go all out for Halloween. 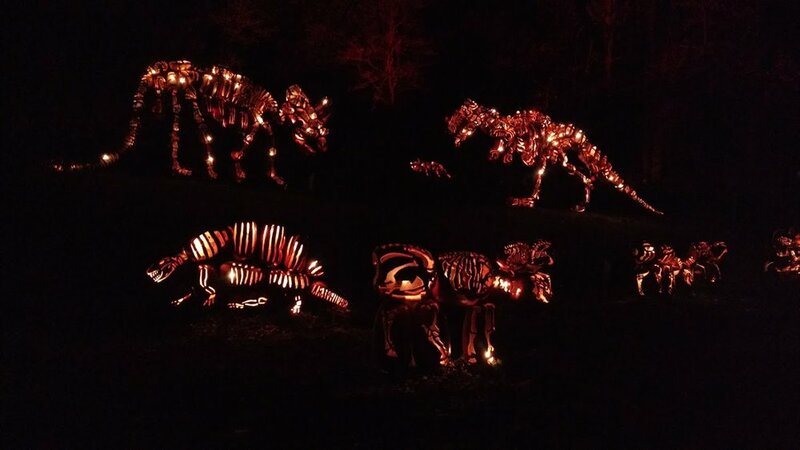 Their dinosaur trail and beautiful conservatory are great year round, but come October there is a spooky maze, a fairy garden and then in the main house, there is an incredible train show. The house is also decorated to the nines. There are food vendors, live music, beer tasting, face painting and more. The event takes place October 6, 7, 8; 13,14; 20, 21; 27, 28 from 11am - 4pm. Tickets are $10 for adult and $5 for children 12 and under. Their annual event is back for another season on October 28th from 1pm - 2:30pm. Come in costume and let the clues lead you around the farm to find some goodies for your trick or treat bag! Each clue will take you to a new animal location. Visit Heckscher WILD! for a chance to meet some cool creepy crawlies and stop by the Overbrook Nature Center building for self-guided crafts and their popular slime table! Stamford Nature Center also boasts my families favorite playground, which will be in full swing during the event. Tickets are $5 per family for members, and for non members it is $5 per family plus the gate admission to the Nature Center. The gate admission rates are Adults: $12, Seniors (65+): $10, Students (18+): $8 (with valid ID), Children (4-17): $6, and Under 3s are free. On October 26th, from 6:30pm-8:30, Your kids can meet creepy critters like bats, snakes, and spiders, and make their own slime. This year NCNC is hosting a jack-o-lantern carving contest--families are invited to carve a pumpkin at home and deliver it to the center. The Halloween Spooktacular will end with a walk through the woods to view the pumpkins all-aglow. Costumes encouraged, and appropriate for all ages. Admission is $10 per person for members, $15 for non members. Kids under 2 are free. Join ambassador wolves Alawa, Nikai and Zephyr for the WCC’s Halloween Party! The Ambassador wolves don’t do tricks but sharing a howl is always a treat. Holiday appropriate goodies will be offered to guests and wolves! Guests will also potentially behold critically endangered red wolves and Mexican gray wolves too. Costumes are strongly encouraged! Pre-registration is required. The event takes place Saturday Oct 27th at 2pm and 5:30pm, and Sunday Oct 28th at 11am and 2pm. Tickets are $14 for adults and $11 for children under 12. Scary stories are always great fun but even more so fireside. 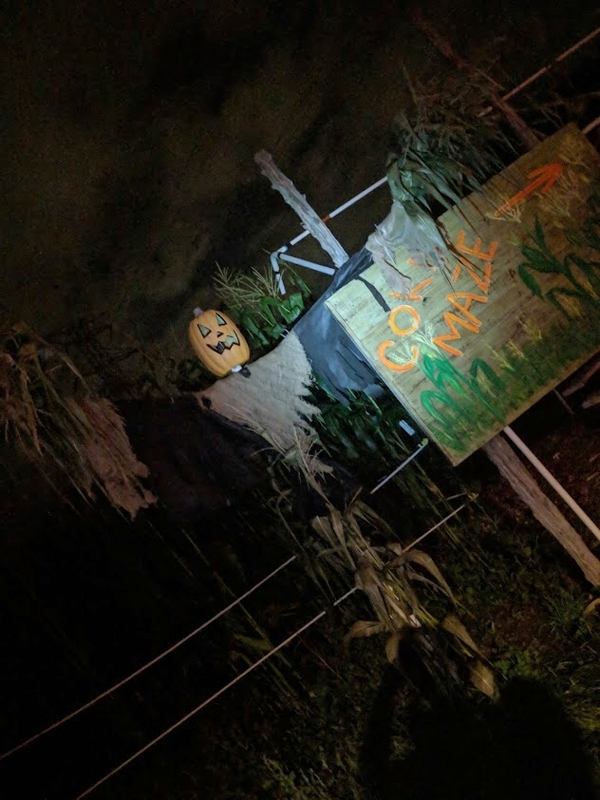 Older kids can hear some spine-tingling tales at 7-8 p.m. Oct. 12.. On Oct. 20, the younger set can stop by the farm in costume to find plenty of Halloween themed (but not scary) things to do. Activities include: A boo walk where children can search for hidden Halloween treats on a trail; and trick or treating fun on Halloween. "Scary Stories on the Farm" Oct. 12, 7-8 p.m. Children 10 and older, pre-registration required. 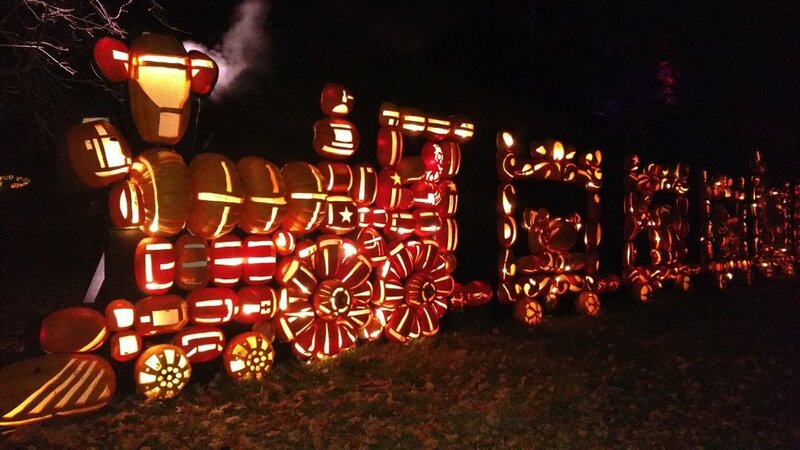 "Boo Walk" Oct. 20, noon-3 p.m. "Halloween on the Farm" Oct. 31, 10 a.m. to 3:30 p.m.
Take a trip and enjoy the wonderful views and colors of autumn throughout the upper Naugatuck Valley on our Pumpkin Patch Trains! These special trains will bring you down to Waterville, where the beautiful Naugatuck River closely follows the tracks, crossing under in several places allowing for great views of the river and surrounding scenery. Visitors stop at RMNE’s very own pumpkin patch. Families go out and select their very own pumpkin to bring home. The ride runs about 1.5 hours and the staff is super friendly. This runs October 13th, 14th, 19th, 20th, 21st, 27th and 28th. Tickets are $18 for adults, $16 for kids 3-12, $16 for seniors, and kids under 3 are $1. On October 23rd, from 10:30am - 4pm, come celebrate in the town of Mamaroneck. This annual event is a big attraction, with a costume parade down Mamaroneck Ave, a haunted house in the Stephen E. Johnston pavilion, crafts, games, treats and more. Attractions and times include 10:30am Window Decorating at Robert’s, 1pm Parade to the harbor, followed by Harbor Island festivities including Haunted Houses, Hayride, Music, and Kids’ Korner Activities. Great for families! The Nyack Chamber of Commerce will host its 31st annual Halloween Parade on Saturday, October 27 from 5:30 to 7:30 pm (rain date Sunday, October 28) in the heart of Nyack. Festivities begin at 3:00 pm. The event, organized by the Chamber and sponsored by leading local merchants, is the largest parade of its kind outside New York City, second only in magnitude to the Greenwich Village event. It was voted the 4th Best Halloween Parade Nationwide by the Travel Channel. The event features marching bands, festooned fire trucks, floats and a host of costumed revelers — with serious cash prizes, totaling over $2,000, going to the most creative among the parade’s participants. All are welcome to march and register for prizes. Before the parade at 2 p.m. come on down to Main Street for the Trick or Treat trail, where kids can stop in for goodies at the local shops. There will also be a dance party after the parade. These are free events. On October 29th, from 12pm - 4pm, White Plains downtown, between Martine Ave. and Main St., will be transformed into a Halloween Festival for school age children and their families. Activities include: pumpkin patch, corn maze, crafts, scary tattoos, storytelling, DJ, and magic show. Everyone is invited to showcase their costumes in the parade. This family event is good for kids of all ages. Most activities are free, but there may be a minimal charge for some venues. On October 21st, from 12pm - 3pm, Trick-or-treaters can get a jump start on Halloween at Harvest Fest on The Hill. Children are encouraged to come in costume and trick or treat at stops throughout the shopping center. A variety of kids activities including a petting farm, and pumpkin decorating will keep little ones entertained – while adults can listen to live bluegrass and satisfy food and drink cravings with seasonal fare and drinks. Free admission. Kids can trick-or-treat from noon – 1 p.m.
2018 marks the 19th consecutive year of Scared by the Sound Haunted House located at historic Playland Amusement Park. The only thing scarier than a closed and abandoned amusement park after dark is what you'll experience at this 12,000 square foot haunted house and cemetery, located next to the darkened rides and Seaside Walk. This haunt is also home to a terrifying cast of characters all awaiting for your arrival and most eager to help you get your Halloween season adrenaline rush. It takes place Oct 12th, 13th, 14th, 19th, 20th, 21st, 26th, 27th, 28th. Tickets are $20 per person, available in advance online or at the box office nights of the event. Parking is free. This Halloween’s all-new edition of Jay Ghoul’s House of Curiosities is based on classic mystery stories. It’s 1922, and a group of archeologists has unearthed an Ancient Egyptian tomb – but they barely have time to celebrate their discovery before the diggers each start dropping dead! Your group has arrived at the dig site (Lyndhurst mansion) to help determine the cause of the deaths – is it the Pharaoh’s curse or a cold-blooded killer? This Halloween, you must solve the mystery before tragedy strikes again! Take a journey through the mansion to meet the cast of zany archeologists, local personalities, and unscrupulous smugglers. But be careful…each of them has their own secrets and superstitions. About the performance: The 40-minute performances of Jay Ghoul’s House of Curiosities take place exclusively at night when the mansion comes alive through eerie lighting and Halloween decorations. This is not a Halloween haunted house – the scariest thing may just be the bad puns! It takes place Oct 19th, 20th, 21st, 25th, 26th, 27th, 28th, 31st.Tickets are $25 for adults and $20 for children 12 and under. Advance tickets are necessary. APPLES, and PUMPKINS, and DONUTS, OH MY! This charming farm in Hopewell Junction hosts a Fall Harvest Festivals each weekend featuring food trucks, live music, games and a barbecue. 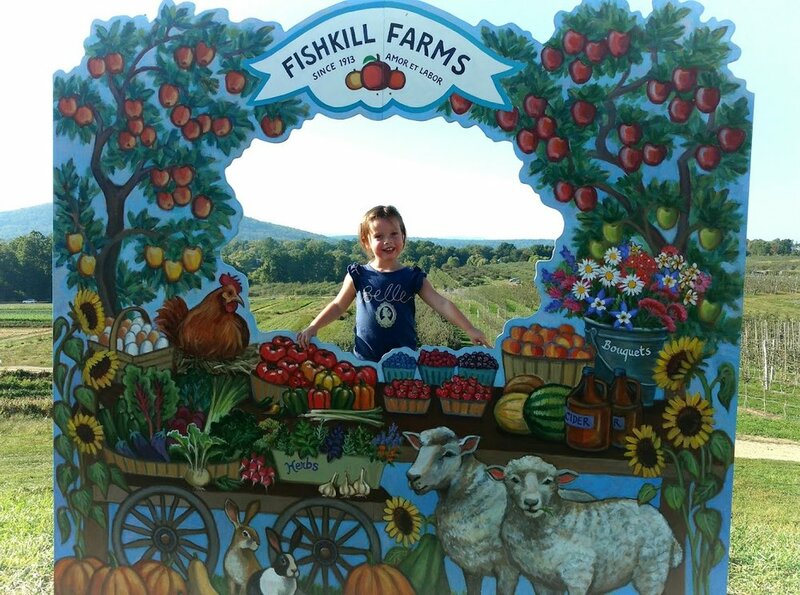 At Fishkill farms, you can meander through a corn maze, pick your own fruit, go on a hayride, drink fresh pressed cider and try out some mouth watering apple cider donuts. Their farm store is top notch. Open 9am - 6pm daily. Admission is $5 for fruit and vegetable picking for adults and children over the age of 12. The cost of the fruit you pick is not included and will be based on the final weight at the end. These two farms are across the street from one another. Their close proximity to the Croton Falls train station make them a popular day trip for New York City residents to get into the country for a day and pick those apples. Despite their weekend crowds, both farm put on a great show for their weekly fall festivals. Corn mazes, pony rides, games, live music, face painting, food vendors, farm shops and more. At Harvest Moon, admission is $5 on the weekends, and apple picking bags are $30. At Outhouse there is a $10 charge for parking on weekends and it is $25 for a pre paid pick your own apple bag. Pumpkinseed Hill is one of the best places to pick your pumpkins straight off the vine. A quick hayride brings you to the pumpkin patch, and there are plenty of wheel barrows to help wrangle the big ones. You can also visit with a handful of farm animals, walk through a small corn maze and take plenty of cute photos in festive cut outs. The season runs daily through Halloween. Guests can visit the farm from 10am to 5:30pm. Admission is free, but you pay by weight for any pumpkins you pick. Very popular for apple picking. It can get very crowded on the weekends, but the stunning setting and extensive petting zoo for little ones usually makes it worth it. Their long hayride up the hill is one of my personal favorites in the area.They have a great variety of apples for picking, and the selection of baked goods at the store is fantastic. All kids (and grown ups) love the fun size, bright red, apple shaped ciders for the road home. They are open 9am-5pm, 7 days a week. Pre purchased bags are required before entering the orchard, and backpacks and other carriers are not allowed for fruit picking. There is also an additional fee if you wish to visit the petting zoo section. On King Street in Greenwich, sits one of the most welcoming and lovable small farms. Augustine’s. 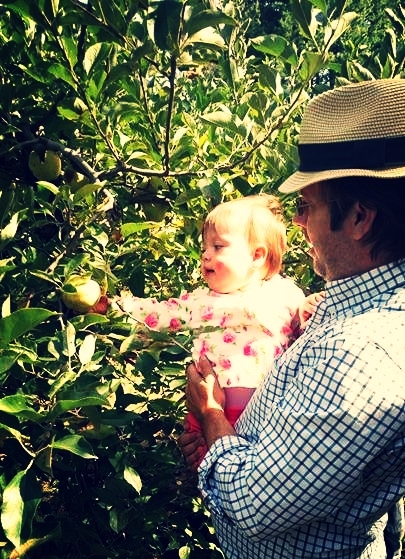 Visits to the farm have been a part of my life since I was born, and I now share the tradition with my daughter. It has been run for decades by Farmer John and Kathy, and they well and truly have pumpkins to please every taste. 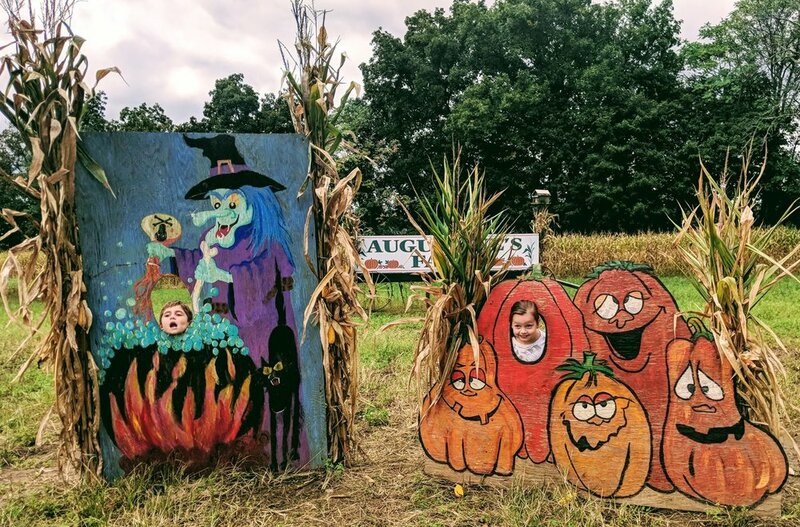 This is not an extensive facility with hayrides and pick your own orchards, but it makes up for it in heart, phenomenal quality fresh fruits and vegetables, super fun cutouts for memorable photo opportunities, and some of the best Halloween cupcakes, available on weekends. They also have farm fresh eggs, crisp apples, local honey, mini pumpkins and gourds in all shapes and colors. Support this local gems that has survived for generations.